PC Racing Motorbike Suit -! PC, Additional Charges May Apply. 1.3mm Top Grain Cowhide Leather. Original YKK Zipper at Front and Cuffs. We reserve the right to refuse any return from objective reason. We are not responsible any Custom Charges. 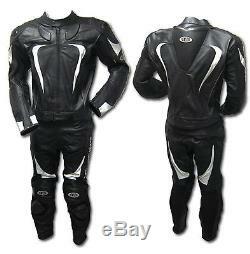 The item "2-Piece-Motorbike/Motorcycle Cowhide Leather Jacket, Pant-SUIT Racer Biker-MotoGp" is in sale since Thursday, June 28, 2018.